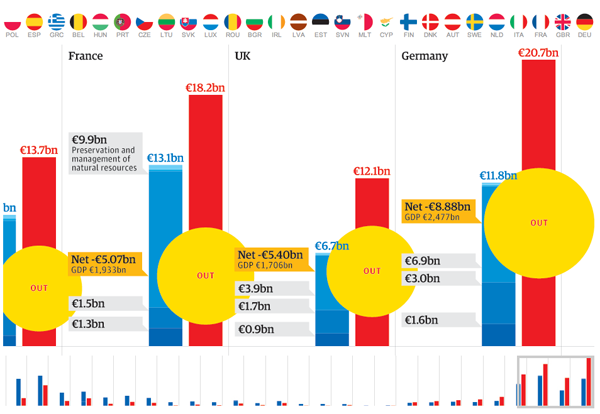 The Guardian has an interactive piece that details payments to and from European Union member states to institutions, determining whether each state is a giver or receiver. The concept sounds all well and good. However, the piece itself feels clumsy with too much scrolling and whipping about to pan across the whole EU. 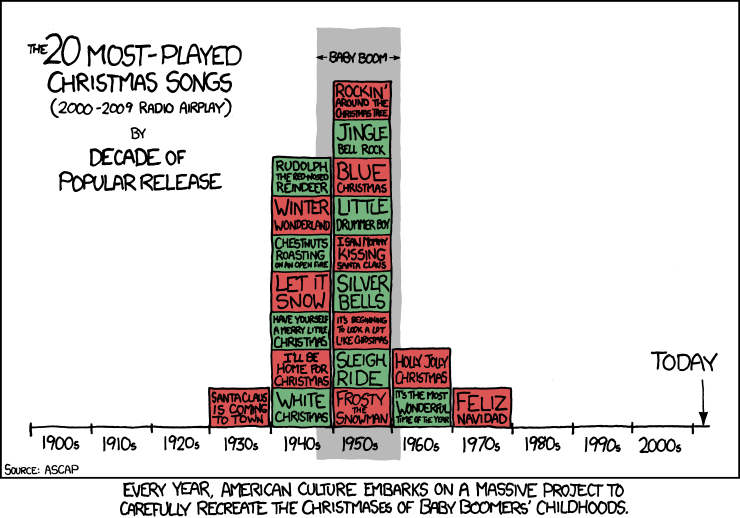 The charts look a tad heavy—which could have been remedied for a more concise piece—and the callouts beg for a level of interactivity that is otherwise lacking. Lastly, I have concerns about the list of countries at the top, although these may stem only from the point of view of an American not too familiar with Europe. Flags are not circles, they are, in most cases, rectangular in shape. Does cropping a symbol or icon of a country make it more or less useful of a symbol or icon? Furthermore, do the British recognise the flags of their fellow EU member states? The country icons/flags call for some type of sorting function, to compare payments and receipts and their balance. But, instead, they sit there in unalterable silence, providing only an economic overview when clicked. An overview that through its staid design feels more like an afterthought. Simple graphs can tell great stories with little annotations. 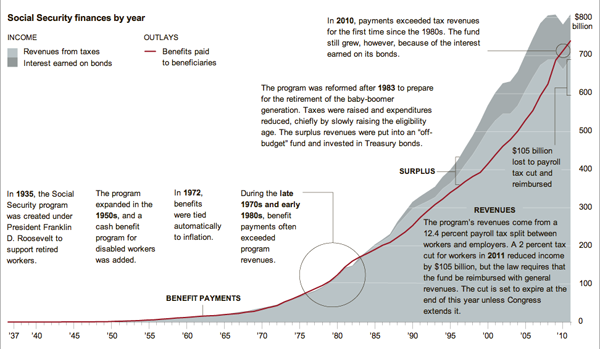 This graphic by the New York Times illustrates that point well with a stacked line chart set behind a line on the same scale. The two should match, or at least the red should be beneath the greys. When they don’t, you have a story and the Times calls it out. Unfortunately, I call it a ‘no kidding’ type of map. 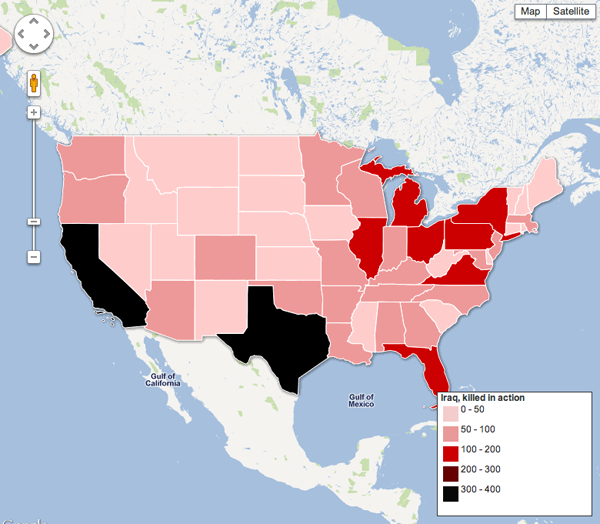 The data, accessible via the Guardian here, corresponds nicely with a list of states by total population. Of the top ten countries in KIA, only Virginia is not among the top ten in population; it is 12th. The country thus not in the top ten in KIA, but in population is North Carolina. It’s rank in terms of KIA? 11th. The data is interesting and worth depicting if we are to reflect. But, perhaps a more suitable visualisation could have been chosen. On a personal note, these Google Maps overlays are annoying when, in the cases of, e.g., Wisconsin and Massachusetts, the shapes are incorrect. Perhaps coastlines are not as easy as states with ‘straight lines’ for boders, but we would do well to try and make irregular coasts at least somewhat correct. 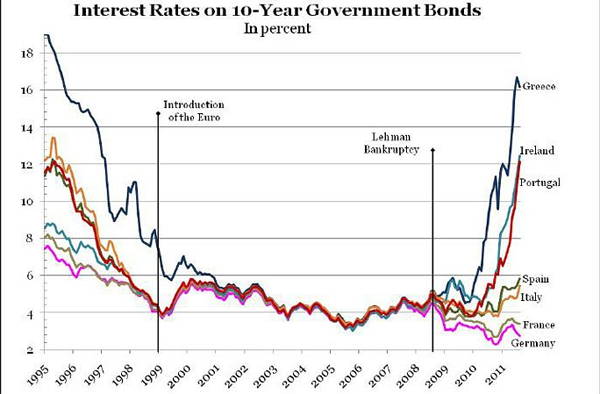 These charts are not particularly well designed, but they were chosen by top economists for the BBC to talk about 2011. Technology changes and changes rapidly. The United States led the way with cabled phone networks. Now, countries in Africa are skipping landlines and moving straight to mobile phones. The New York Times has an piece on the changes in technology and accompanies that piece with small multiples of choropleth maps that showcase different technologies and their prevalence. What is interesting about these maps is that the Times eschewed the conventional Mercator or Robinson map projections and went with a slightly more unusual layout. But, a layout that saves some space by its contortion of the world’s oceans. Was their reason spatial or something more about maintaining consistent area? I would be curious to see the piece in print to see if it needed to fit a narrow column. All in all, an interesting set of maps. I don’t know about you, but to me, it’s beginning to look a lot like campaign season. At least from what I read on the internet. 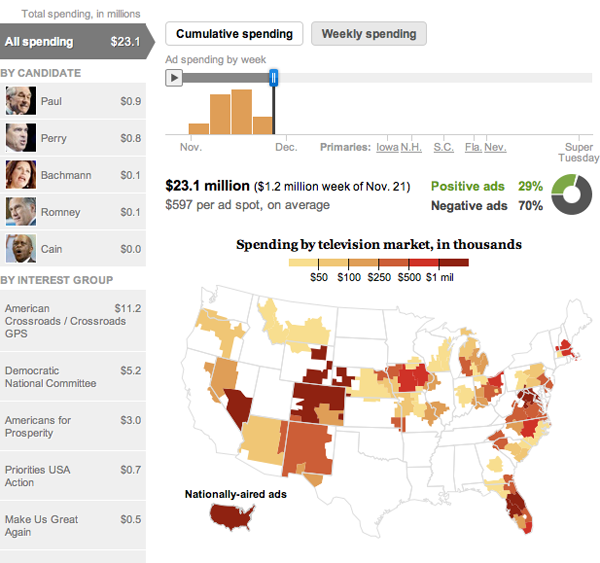 Because, according to this interactive piece by the Washington Post, there has been little local campaign spending on ads in the Chicago television market. By clicking on the left, you are able to see the spending amounts and spending places of ads by both personal campaigns and interest groups. For national ad campaigns, there is a small outline of the continental US in the bottom left. Above the map you have some facts about the spending and spending over time and a curious bit about whether the ads are positive or negative. Already if you move from the beginning to now, you can watch the positive ad number slip. 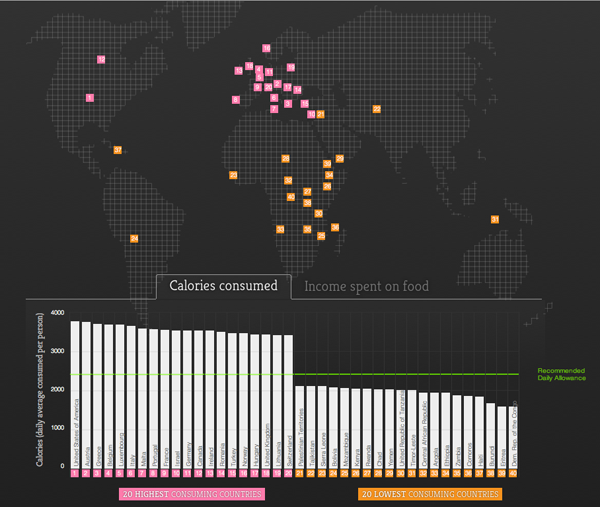 Via Fareed Zakaria, an interactive piece by Food Service Warehouse that looks at the leading nations of food consumption in calories—and what people spend for their food. The map is not entirely useful, although it does at least hint at the geographic locations of the largest consumers (the West) and the smallest consumers (the Rest of the World). More interesting is the simple bar chart at the bottom of the interactive piece. The BRICs are ten years old. Well, not really. But the concept of Brazil, Russia, India, and China becoming some of the world’s largest economies is. Well, not even that necessarily. But the coining of the term BRIC is a decade old. 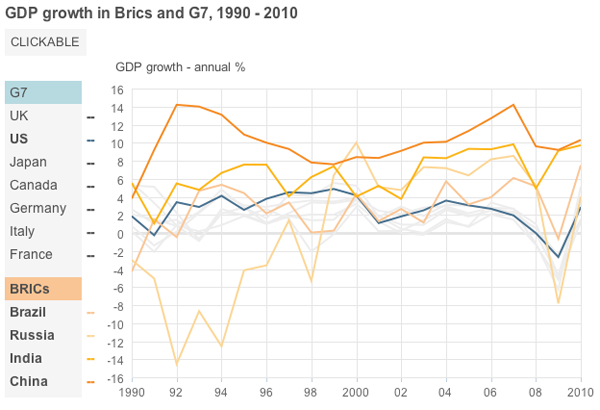 So the BBC has a small interactive piece showing why the BRICs matter. They do some interesting things with the use of hues and tints to group lines in the line charts and provide consistent groupings throughout the piece. And they have photos of leaders. Just in case you do not know what the finance minister of Italy looked like back in 2001…just do not ask me to remember his name. 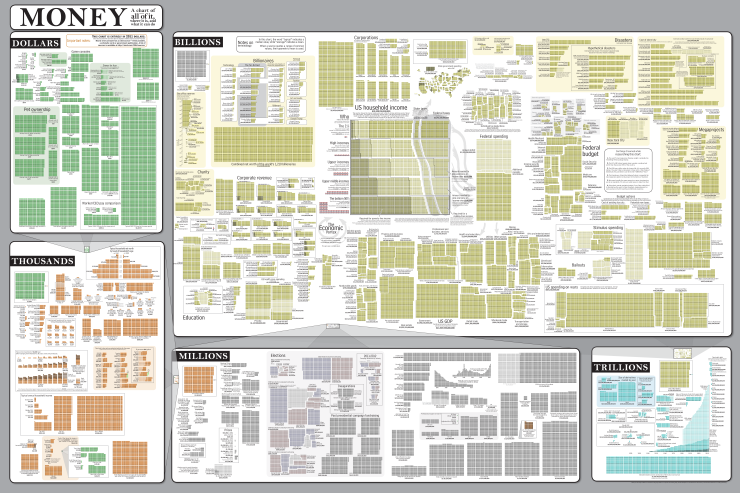 Author Brendan BarryPosted on 21 November 11 11 November 16 Categories UncategorizedTags charting, data visualisation, economics, information design, xkcdLeave a comment on What’s a Dollar Worth These Days?